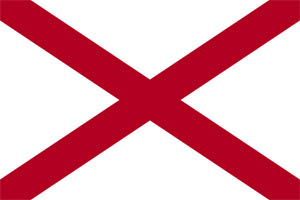 Alabama is the 30th largest state in the United States of America in terms of total land area. Three fifths of this land area is basically a plain that descends towards the Gulf of Mexico and the Mississippi River. Meanwhile, the state’s inland waterway system is the second largest in the country. It is located in the southern region bordered by Tennessee to the north, Mississippi to the west, Florida to the south, and Georgia to the east. The capital of Alabama is Montgomery, while its largest city is Birmingham. Natural and historical areas of interest in Alabama include the Horseshoe Bend National Military Park, , Russell Cave National Monument, Tuskegee Airmen National Historic Site, Little River Canyon National Preserve, Tuskegee Institute National Historic Site, Conecuh National Forest, Talladega National Forest, Tuskegee National Forest, William B. Bankhead National Forest, Natchez Trace Parkway, Selma to Montgomery National Historic Trail, Trail of Tears National Historic Trail, and Natural Bridge Rock. Alabama is nicknamed the Yellowhammer State, after the state bird. The yellowhammer is a woodpecker that mainly eats ants. It is also called “the northern flicker”, “the common flicker”, or the “flicker”. This bird was chosen basically due to its likeness to Confederate uniforms. As the story goes, a confederate veteran mockingly jeered at new confederate recruits, saying “Yallerhammer, yallerhammer, flicker, flicker!” as their uniforms of grey and brilliant yellow reminded him of the bird. After that, recruits were called the Yellowhammer Company. Later on, this became applied to all the troops, and finally to the whole state.